Does Windows 10 Need Antivirus? In today’s digital world, malware and cyber attacks have become ubiquitous. Gone are the days when there was only a handful of malicious programs such as viruses. Nowadays, new and powerful malware variants such as the ransomware, spyware, keyloggers, and various new forms of malware have become more of a problem for individuals and businesses alike. Real-time detection of unknown and malicious files, and protecting your computer from such harmful viruses and other malware programs becomes a necessity in today’s always-connected world. Keeping that in mind, Microsoft has released Windows Defender with the release of Windows 8. Windows Defender is an anti-malware program that is built right into the Windows OS- meaning lower consumption of CPU resources and adequate protection against malware. Moreover, Microsoft also updates its Windows Defender utility frequently with new data definitions (virus signatures) to keep the latest and more potent threats at bay. So, does Windows 10 Need Antivirus? The answer is yes and no. With Windows 10, users don’t have to worry about installing antivirus software. And unlike the older Windows 7, they won’t always be reminded to install an antivirus program for protecting their system. However, with the rapidly evolving malware threats, software and hardware vulnerabilities, does sticking with the built-in Windows Defender tool as your primary Antivirus program enough to protect your computer from malware and cyber attacks? Let’s find out. Is Antivirus software necessary with Windows 10? If some malicious files infiltrate your computer and you can’t get rid of them, Windows Defender will take care of them. You can also run the Windows Defender tool from a from a USB drive, even when you are not connected to the internet. This should find those harder-to-kill malware programs. Windows Defender is more than a baseline defense, it’s a good tool, and there’s no reason not to use it. You can also use Windows Defender alongside other Antivirus software. Windows 10 Antivirus (Windows Defender), is an integrated anti-virus and anti-malware solution that is just as good as any other free antivirus solution (and probably more comfortable to use for the novice). Plus, there are no bundled toolbars or annoying popups that prompt you to buy the pro or premium version. Windows 10 Antivirus provides the same level of protection against malware as any other Antivirus for Windows 10 provides. If you’re using Windows 10 computer with up-to-date software, you can rely on Windows Defender virus removal tool built in that won’t hog your CPU resources and will keep an eye on processes and tasks in the background. But, in today’s world of ever-changing cyber threats, adding an extra layer of protection can be beneficial. The Internet has become a part of our everyday lives, along with it, it also brings in a number of threats. Hence, it is highly essential for you to protect your computer from malware threats. Though Windows 10 comes with built-in antivirus and anti-malware tool (Windows Defender), it might not be able to protect your web browsing activities and malicious links. You might accidentally click on a malicious link that downloads malware or adware onto your computer. So, it is important to install antivirus software that offers web protection or internet protection. 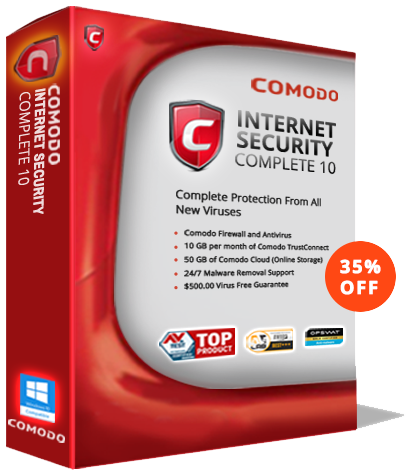 Try Comodo Antivirus which provides multi-layered security in a user-friendly interface. It combines the Host Intrusion Prevention System (HIPS), Defense+ and Auto Sandbox technology to contain even the potent malware. Unlike all other Antivirus products that use “Default Allow” security posture, Comodo Antivirus uses “Default Deny” security posture. “Default Allow” used in all other AV products allows unknown files (malware) into your computer, i.e., if a new malware which is not updated in the antivirus’ database, then the antivirus simply allows that malware to run on your computer. With Comodo Antivirus, unknown files and malware are made to run on a container (virtual environment) until a verdict comes from Valkyrie (unknown files analysis system). Download Comodo Antivirus today and protect your computer from all types of malware and cyber attacks. It protects your computer, files as well as your online activities from malicious threats.